Renovated four bedroom, two and half bathroom rental with mountain views. This home has been recently updated and is extremely well kept. There is an open main living area with a nice flow from the kitchen through to the great room which features the dining and living rooms. The wood burning fireplace adds to the charm as well as the expansive deck offering stunning views. The main floor has plenty of closet space and a half bath as well as a small fourth bedroom that could be used as a home office. The three main bedrooms and two full baths are located on the lower level. There is a spacious master suite with an en-suite bath and walk-in closet. In addition to the master suite there are two more full sized bedrooms and another full bath on this level. Located at the end of the hall is a laundry room and storage closet. This home can come completely furnished or unfurnished. 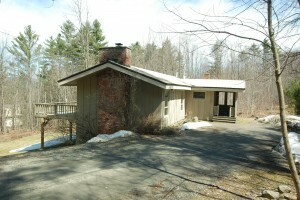 Located minutes from the village and the Stowe Mountain Resort this rental offers an ideal mix of privacy and close proximity to all Stowe has to offer. Call us today for short term and seasonal rates.